Texas Top Aviation’s 4 Day Piper Malibu/Mirage/Matrix Initial Training is insurance approved for Piper PA-46 owners. Owners of the high performance, complex, pressurized Piper Malibu, Mirage, & Matrix models will receive 4 days of in-depth PA46 training. In your Piper Malibu/Mirage/Matrix training, your insurance approved instructor will give you expert instruction in your airplane. Texas Top Aviation has developed its own Piper Malibu/Mirage/Matrix, insurance approved transition training course that is easily modified to meet your specific airplane and needs. The requirements for a Flight Review & an IPC are met during the Initial Training Course. 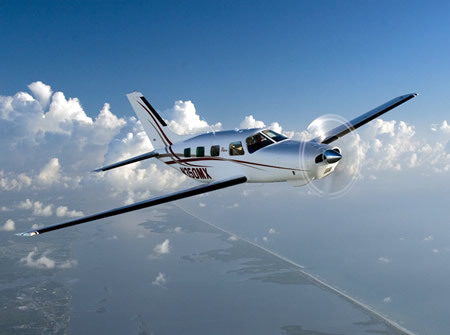 Texas Top Aviation’s insurance approved, 2 Day Piper PA46 Recurrent Training Course provides a systems overview, avionics review, and emergency procedures review during the first morning of ground school. Then, the flight training covered in the rest of the course will confirm your proficiency level with the airplane, or knock off any rust you have developed since your initial training. The Recurrent Training course also encompasses an IPC and a Flight Review. Texas Top Aviation follows the FAA’s recommendation of doing some sort of proficiency training every four to six weeks. That way, pilots stay proficient on the necessary maneuvers for Flight Reviews and IPCs. This proficiency training involves 2-4 hour training sessions over the various visual and instrument maneuvers required on FRs and IPCs. See Appendixes 4 & 7 of AC 61-98B for more information on the FAA’s Proficiency Practice Plans. Need a Flight Review or IPC in your Piper PA46 in between your yearly training? Texas Top Aviation can help. We go above and beyond the requirements to stay current; we ensure you are proficient and, most importantly, safe to fly. FRs and IPCs usually take 4 hours to complete apiece. Have you recently upgraded your avionics in your PA46? Do you need training on how to use your new GPS or glass instrumentation? Texas Top Aviation, LLC provides high quality avionics training for Piper Malibu/Mirage/Matrix owners. Whether it’s Garmin, Aspen, or Avidyne, Texas Top Aviation will get you comfortable with your system. We utilize GPUs on the ground to reduce stress while increasing learning. Call Texas Top Aviation today to schedule your Piper Malibu/Mirage/Matrix Training and experience the difference!